Treating hypercholesterolaemia is part of basic prevention of cardiovascular disease. As the generalised use of statins becomes increasingly controversial (see article by Dr Dominique Rueff in Nutranews June 2005), there is renewed interest in natural alternatives. These clinical trials were conducted with the same patented product, and using the same dosage, as that which we are offering to our customers. 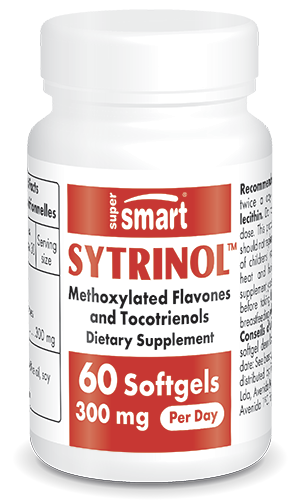 Unlike ingredients which tend to block cholesterol absorption in the gastro-intestinal tract, Sytrinol™ modulates and balances cholesterol production directly in the liver. Sytrinol™ is also a powerful antioxidant with important, additional benefits for the cardiovascular system. Other ingredients: olive oil, soya lecithin, beeswax. Sytrinol™ KGK synergize Inc.
Each softgel contains 150 mg of Sytrinol™. Take two softgels a day when convenient.